St. Barth is often considered as the craziest airport in the caribbean. 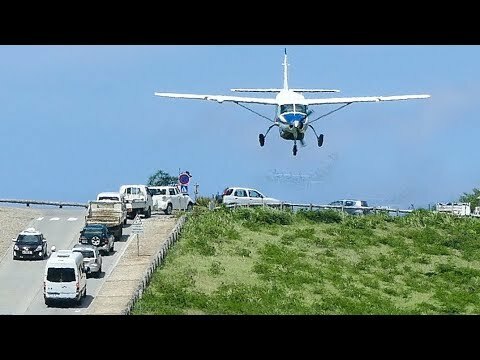 Pilots who land at this unique airport have to dive down a hill which is located right behind the runway. There is a street on the hill aswell and it` s quite funny to watch the cars pass by even when a plane is passing by just a few meters above the roofs. You won` t see any big planes at this airport. There are mainly Cessnas, Twin otters and BN-2 Islanders which operate between the caribbean islands. The cockpit footage was filmed in a Cessna 208 Grand Caravan. The routing was St Martin - St Barth - St Martin.